IN THE SUMMER OF 1912 a strange malady assumed epidemic proportions in Victoria. It attacked the poor and the rich, the educated and the uneducated. The virus was spread by top-hatted, loudly dressed young men, whose Pierce-Arrow, Peerless and Packard automobiles, the newest symbols of opulence, were parked outside clubs like the Union, Pacific, the Camosun in the Central Building and outside real estate offices all over town. They injected the germ of desire into thousands of people who until then had been more or less content with their modest stations in life. What attacked Victoria was the biggest wave of land speculation in its history. The importuning of pedestrians by these salesmen who portrayed · with more enthusiasm than regard for truth the fortunes to be made by buying land was backgrounded by the hammering of carpenters, the shouts of carters with their heavily laden drays and the tumble of falling masonry as old buildings gave way to new. Working people pledged their salaries and wages. Many thrifty , elderly people invested their life savings. Craftsmen, labourers, civil servants, merchants, bank clerks ... all classes of citizens saw the promise of El Dorado and were prepared to back financially their illusions. Many of the realtors themselves were infected by the speculative enthusiasm and invested (and lost) heavily. Fortunes , were made by the few who sold out in time. But for many hundreds of ordinary citizens, who supplemented modest incomes it wasn't so. Land sale promoters produced charts which showed railroads lacing the province like a spider's web. The environs of Victoria including Deep Cove and Sidney were portrayed as future vast dormitories for commuters. The C.P .R. trans-Canada railroad and E. & N. Railway were already in being. The Grand Trunk Pacific was being extended from Edmonton to Prince Rupert. The Pacific Great Eastern had been given a charter and financial guarantees, and around Victoria no fewer than three railroads were planned, or perhaps one should say "promoted," additional to the E. & N. Railway. The first was the well-known "Cordwood Limited" from Victoria to Sidney. It affords an illuminating example of the intertwining of business and politics so characteristic of the period. Directors when the Company was incorporated on April 23, 1892. There was a four-year delay in getting the railroad into service while efforts were made to sell the operation to the C.P .R., but nothing came of them. In the meantime a fourth figure had arrived on the scene. He was J. White, a Toronto politician, temporarily out of office, who had much experience of behind the scenes negotiations. He came to Victoria as representative of the Toronto & B.C. Lumber Co., which was desirous of obtaining concessions in the province and thought White would be useful to them. He was introduced to the Brethours, a company was formed and a lumber mill built in Sidney. The mill stood in several acres of land, covering the entire waterfront and was leased by the Brethours at a rent of 10 cents an acre per annum. The mill was awarded the contract for supplying the railroad with ties and was put in charge of White's nephew. When the railroad was finally built the nephew become Sidney agent and Samuel Brethour Victoria agent. A year after formation of the V. & S. Railroad Company in 1892 control passed to a consortium consisting of the Great Northern Railway, A. W. Guthrie, a U.S. financier, and T. W. Paterson, a public works contractor who later became Liberal member for North Saanich and lieutenant-governor of the province. The Great Northern Railway issued bonds for $300,000 to finance construction and by some extraordinary behind the scenes moves the City of Victoria and the Provincial Government were induced to guarantee the 5% interest on the bonds. They continued to pay this interest until 1913 when "Cordwood Limited" went into receivership. The railway never made any money, but Samuel Brethour and T. W. Paterson obtained what was said to have been a most profitable contract for supplying the railroad with cordwood. First public run of the Victoria & Sidney (V. & S.) railroad was on April 5, 1896. The service was received rapturously. The 16½mile run took 30 minutes, but as time went on punctuality became of ever less account. It was understandably popular with passengers who did not have to foot the bill personally for its deficits. At weekends the carriages bulged with trippers. It was a leisurely railroad ... two trains a day, frequent unscheduled stops to deliver messages and parcels ... sometimes to enable passengers to gather mushrooms or wild flowers. Other unscheduled stops were due to mechanical difficulties such as the piston parting company with the cylinder and flying into the bush, or failure to made a gradient. It was always interesting to speculate how many tries the engine would make to conquer the gradient at Royal Oak. The route was from the station on Blanshard Street, where the entrance to the Hudson's Bay Company parking area now is, via Royal Oak, Beaver and Elk Lakes, Keating and Saanichton to the Sidney waterfront. It helped to convert the Saanich Peninsula from an area of farm and logging operations to partly residential territory. The railroad ceased operation in 1922. The V. & S. railroad, as mentioned earlier, went into receivership in 1913. In the same year the second Peninsula railway was started, namely the B.C. Electric Company's inter-urban line to Deep Cove. It ran from Douglas Street, via Burnside Road, Tillicum, Strawberry Vale, Wilkinson Road, West Saanich Road and Tod Inlet to Deep Cove, the terminus being approximately at the site of the present Deep Cove Chalet. The advent of the automobile was partly responsible for its demise. But realtors did well out of both railroads. Their large advertisements extolling the Saanich Peninsula and forecasting a densely populated future filled the newspapers. It was said that every lot alongside the tracks of the V. & S. and Inter-urban railroads was sold before the rails were laid. In spite of the failure of these two railroads yet another Saanich Peninsula railroad was built. The Canadian National Railways began in 1917 a 15½-mile extension of their line from Victoria to Patricia Bay and Sidney, with freight connection from Sidney by the S.S. Canora to Vancouver, abandoning the extension after severe losses 18 years later. The banks were equally optimistic about Victoria's future. The evidence of general growth was there for everyone to see. In the period 1890 to 1914 - mostly after 1900 - new buildings transformed the downtown area. The still standing granite-faced Bank of Montreal building was erected in 1897 at 1200 Government Street, on the site of the former house of Mayor Harris. Other buildings of the period included the Sayward Block, the Union Bank (now Royal Trust) Building on Government Street, the Central Building on View Street, the Metropole Hotel, the Belmont Building, the Pither & Leiser Building (1904) which now houses the Recreation Department of the Provincial Government and the Bank of Toronto and Campbell buildings. In 1911 the Stobart and Pease Building was erected on Yates Street. It was acquired by the Standard Furniture Co. in 1959, while almost next door to it the Dominion Hotel put on a new wing. The Jones Building on Fort Street was also built in 1911. More reassuring than any other building was the construction in 1913 by the Hudson's Bay Company of their department store on Douglas Street on the site of St. John's "Iron" Church. If this great Company, founders of Victoria, had such confidence, who was the small speculator to have doubts? The prominent citizens who attended the gala opening of the Royal Theatre in 1913 seemed to embody the stability which arises from tradition and well-founded optimism. They included Mr. and Mrs. J. Matson of the Colonist publishing family, Mr. and Mrs. Henry Croft, Mr. and Mrs. Hickman Tye, James and Mrs. Dunsmuir, Mr. and Mrs. R. Elliott, Hon. and Mrs. Wm. Templeton, Dr. and Mrs. M. Robertson, Hon. and Mrs. D. M. Eberts, Hon. W. and Mrs. Bowser, Hon. W. R. and Mrs. Ross, Mr. and Mrs. Gavin Burns, Mr. and Mrs. Charles Lugrin, Simon Leiser, president of the Board of Trade, A. E. Todd, Andrew Wright, agent for the developers of the Uplands estate, and Fred Pemberton. The proscenium arch which they so admired at the inauguration of the Theatre is still the finest example of alabaster work in Victoria and an enduring tribute to the city's craftsmen of those days. Both the Parliament Building and the Empress Hotel had by 1913 put on additional wings. Hatley Park ( Royal Roads), Craigdarroch Castle, "Burleith" and scores of substantial homes on Rockland Avenue and on Lampson Street testified to the solidity of local citizens. Lauren Harvey and husband George Allan Kirke. It is one of Victoria's outstanding homes. Maud Street was graced with "Illahie" built by Charles Todd, son of J. H. Todd, while 1035 Belmont (now the Camosack Apartments) was the site of the Mr. Justice Martin's home. The building boom also saw the erection in 1912 of the "Alcazar" apartment block on Fairfield Road, a very solid construction. Only a year earlier the industrial area of Victoria was doubled by the acquisition of the Songhees Indian Reserve. The Songhees were persuaded to move farther back into Esquimalt and under their Chief Freezy, whose favourite attire was tall hat and long coat, were paid $434,000 for giving up their land. The Indians may have wondered where the process would end. Around the 1860's they were swarming in the Johnson Street ravine and Roderick Finlayson had the Indian (Johnson Street) bridge built to encourage them to cross over to the other side of the water. The $434,000 they were paid in 1912 was much more to their liking than a rickety bridge, but the unexpected windfall may have proved too much for King Freezy; soon afterwards he overturned his canoe while drunk and was drowned. It was not only the Indians who did well out of the sale of the Reserve lands. Sam Matson of the Colonist publishing family put in a bill for $75,000 for services rendered and lawyer H. D. Helmcken a bill for $30,000. They were much criticized at the time. The total cost of moving the Indians was $700,000, including $212,500 spent on the Reserve. Never were so few moved at so great a cost. The industrial and social solidity seemed to be backed by equally solid natural assets. In 1906 the province had produced two-thirds of the total mineral production of all Canada. Capital and miners flowed in from all over the world to exploit the new lead, copper, coal, iron ore, silver and timber discoveries. The U.S. investment in B.C. in 1910 was $65,000,000 and the investors were world-renowned organizations. The fantastic salmon-packing industry fascinated not only United States', but British capitalists. No less than 1,200,000 cases of salmon were packed in one year of the decade. Federal building contributed to the boom. The Ogden Point docks ( named after Peter Skene Ogden, an early Hudson's Bay Company official) were begun in 1913, largely owing to the advocacy of Senator Harry Barnard. They were to enable the largest liners afloat to bring thousands of visitors and settlers here. They were completed in 1917 at a cost of $2,260,000. The Dominion Astrophysical Observatory completed in 1914 was being built and also the Gonzales meteorological station. Provincial government and municipal spending was also at an all time high. Luney Bros. were given a $300,000 contract to build the Mt. Tolmie normal school, named after pioneer Wm. Fraser Tolmie. New sewers were put in all over the city including the extension of sewers on Boyd and Menzies Streets to low water, thus removing the pestilential odor prevalent at times in that area. Trutch and Shelboume Streets were put through in 1912. Victoria itself got the biggest face-lift in its history. In the space of two years ... from 1910 to 1912 the city was transformed from what a resident described as "an unpaved, dirty, badly lighted city" into the "best-paved, best-lighted and best-boulevarded city in North America. "Fifty miles of roads were put in. There was work for every able-bodied man and the busiest bees of all were the Realtors. Everywhere were the large signs of Baron Alvo von Alvensleben who controlled a large part of the $5,000,000 Germans had invested in the province. The Baron also owned six large logging camps and a large acreage of timber land. In the Kaiserhof Hotel ( now the site of the Kent Apartment Hotel, corner Blanshard and Johnson Streets), where German businessmen gathered, more German than English was spoken and more German beer and sausage consumed than beef or local ale. These were facts which some citizens remembered to the Kaiserhof's disadvantage when the Lusitania was torpedoed by a German U-boat, taking down with her 14 passengers from Victoria, including Lieutenant J. Dunsmuir. Hundreds of men raided the Kaiserhof, drank all the liquor, wrecked the interior and threw the furniture into the street. They then went to the German Club, smashed it up and threw the piano out of the window. The German Club was on the second floor of the building which now houses the offices of C. & C. Transportation and Nelson & Harvey, customs brokers, at 902 Government Street. Next to be raided was Simon Leiser's wholesale grocery at 524 Yates Street. All this happened on the Saturday and the mob were threatening the Phoenix Brewery on Government Street when the militia were called in. On Sunday night Mayor A. E. Todd read the riot act in two parts of the City. Among the troops called in was a unit commanded by Lieut. Robert H. B. Kerr who was later one of the first Canadians to join the Royal Flying Corps. The temper of the militia was very aggressive. They regarded the rioters, among whom were many rowdies, as slackers and draft-dodgers. They were prepared to handle them roughly, but the threat of military intervention was enough. There was no more trouble. Subdivisions were created all around Victoria. One of the largest was the Garden City subdivision near Burnside which dropped to the Colquitz River and then rose to Carey Road. Panama Flats subdivision was a little farther out. It had a habit of disappearing under water in winter and was no doubt well suited for the nautically- minded. Beyond Oak Bay were the Cadboro Lawn and Queen's View subdivisions. The Dunsmuirs were selling off Craigdarroch lots at $5,000 apiece. The View Royal subdivision went in. Speculators were comforted by the interest of British capital in Victoria. In the 1880's substantial investments in real estate here and in the Cariboo were made by London publisher Thomas Dixon Galpin who owned the Illustrated London News, the Sphere and the Tatler. Relatives F. W. and H. V. Galpin had homes north of and on Rockland Avenue adjacent to that of A. J. C. Galletly, manager of the Bank of Montreal. In London, Thomas Dixon Galpin was one among many hundreds of rich men. In Victoria he seemed like a Croesus. Galpin bought a block on Government Street, the Occidental Hotel (former Royal Hotel) and many other pieces of property. He also bought out Alsop & Mason, realtors, and called his new firm B.C. Land and Investment Agency. This Company still exists and operates in the same building at 922 Government Street (comer Government and Broughton Streets) as the original firm occupied in 1863. At one time it owned or controlled half of the land in the Victoria area. This land included the McTavish estate comprising most of James Bay, the Douglas estate which included most of Fairfield (500 acres from Heywood Avenue to Ross Bay Cemetery and from Rockland to Dallas Road, including the 33 acres of Government House grounds for which the Province paid a rental of $40.50 per annum). The asking price for 1 ½ acres Quadra at Cloverdale, right in the bush, was $12,000. This included land for which James Douglas had paid the Indians one cent an acre and which he had difficulty in reselling at $ 1 an acre in the colony's early years. Downtown land prices were equally fantastic. Senator J. MacDonald sold "Armadale" in 27 acres in James Bay for $1,000,000 and the Balmoral Hotel sold for $500,000. * It is difficult to say who profited most by the boom, the big landowners or the speculators who sold out in time. One of the biggest landowners was Joseph Despard Pemberton who owned a large part of Oak Bay, the Gonzales district (including Gonzales Heights) and Fairfield (see map). Fairfield Road was put through in 1857. Joseph Despard was an outstanding example of an immigrant who combined an official position with an eye for future land values. The site is believed to be that of the garage now operating at St. Charles and Fairfield Streets. His nearest neighbours were Mrs. Isabella Ross, Victoria's first woman landholder, and Royal Governor Kennedy who came out on the same vessel as Pemberton and his wife. Isabella Ross was widow of Charles Ross who supervised the building of Fort Victoria and purchased a large acreage on Ross Bay which eventually became the Hollywood subdivision. Part of the land was purchased by the City in 1876 to create the Ross Bay Cemetery. As the Pembertons' fortunes improved so did their dwellings. They first built "Glenville" in 13 acres overlooking Ross Bay . "Glenville" when it fell to pieces was bought by John and James Douglas, grandsons of Sir James, who put up homes on the same site - at the end of Masters Road, high on the rocky hilltop. An M.L.A. and a member of the First Executive Council, Pemberton was influential politically and business-wise. He was appointed Surveyor-General and in 1883 began building his famous "Gonzales" home amid 1,200 acres which included what are now the Victoria Golf Club links. He did not get on too well with Royal Governor Seymour. Some people say it was because Seymour, in contrast to Pemberton, favoured New Westminster as the provincial capital. Joseph Despard was a great benefactor of the city he loved. The Royal Jubilee Hospital, the Union Club and many schools owe a great deal to his bequests. Always cheerful and a fine horseman, he fell dead from his horse near what is now the Oak Bay Junction in 1893. He had suffered with his heart for some time and his death occurred during a paper chase. One son, Frederick, built "Mountjoy," 617 Foul Bay Road, burned down in 1953, but the garden walls can still be seen, and the name "Mountjoy" is perpetuated in Mountjoy Avenue which adjoins the Mountjoy estate. Six years before his death Joseph Despard established with his son Frederick Bernard the firm of Pemberton & Son, later to become Pemberton Holmes. It is a significant fact that politics, the civil service or dealing in real estate have always played leading roles in Victoria's business life. The reasons are not hard to seek. Except in the periods of the first gold rushes and of the industrial era ( from about I 888 to 1905) it was difficult to get a living or make money any other way. For a few years, canning, lumber, sealing, shipbuilding and brokerage offered big opportunities. Then these trades and industries, except for lumber, passed out of Victoria control and selling land and property to each other or to newcomers was one of the few alternatives and least risky methods of making a living, or a fortune. From the earliest years everyone who could manage it speculated in land. Indeed one can say that a factor which induced the Hudson's Bay Company to establish a settlement here was partly prompted by prospects of appreciation in land values. At one time, Parliament could do no business because the legislators were absent on real estate deals. Victoria's first independent realtor was W. Backus, an American, whose office started in 1853 was a dozen steps from Fort Street northwards along Wharf. When the gold-seekers came, he knew where the business was to be found and set up his office in the El Dorado Saloon on Yates Street. By 1860, Victoria had eight real estate agents. Government Street was Realtors' row and on it or nearby were the realtors W. A. Harries, J. J. Cochrane, Selim Franklin, J.B. Timmerman, Leopold Loewenberg, W. Hackus, Wight J. Copland and James A. McCrea. When the first gold rushes ended, many lot owners who had hoped for an appreciation in prices found themselves, to use a current expression "holding the bag," with unsaleable lots on their hands. At the same time, taxes on their unsold lots were accumulating. Faced with the sequestration or forced sale of their property these lot holders, who included many legislators, were desperate. A law was introduced extending the period for payment of taxes to give them some relief. But what was relief for the lot holders meant disappointment for those who hoped to buy their property at very low prices. Among such opportunists were DeCosmos ( the Friend of the Universe) and his friend McClure. They saw their chances of a quick fortune disappearing. After a 24-hour filibuster they managed to kill the measure. So attractive was the Realty business that in 1888 Captain Tatlow gave up the position of private secretary to the lieutenant-governor to go into real estate. Then came the great boom from 1905 onwards. By 1914 there were 300 Realty firms in Victoria, for a population of 46,000. Outstanding realtors of the time included F. 0. Richards, whose half-page advertisements substituted for news on the front page of the Victoria Times and Beaumont Boggs, whose fine home "Maplewood" overlooking the Gorge at 133 Catherine, testified to his success. This residence was in 1968 owned by Mrs. Violet Warren, widow of tugboat captain F. J. D. Warren. Realty advertising was the largest single source of revenue for Victoria newspapers. British Columbia trade directories bulged with the advertisements of realtors. But all good things have an end. British capital was the first to become alarmed at the size of the speculative bubble its interest had helped to create. The growth then was not in Victoria itself, but in the environs. 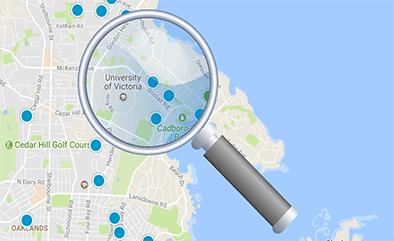 By 1970 there were around 700 registered real estate salesmen in Victoria, not including the many non-registered who bought and sold property on their own account. Among the new salesmen were many who used real estate as a means of supplementing a pension. In Real Estate as in every other branch of business, competition in the 1960's became ever more intense in spite of an increase in the average home value to $25,000 and multiple listing sales of (in 1969) $40,239,000. But there seemed no end to the growth. Premier W. A. C. Bennett in 1958 foresaw the time when every family in the province would own three homes. Realtors, at the same time, were freely forecasting a Greater Victoria population of 300,000 by 1980. While Mr. Bennett's prophecy may have intrigued men with polygamist inclinations, it was very unrealistic for the many who owned single-family dwellings and found it increasingly burdensome to maintain them in the face of ever increasing taxation of the homeowner.